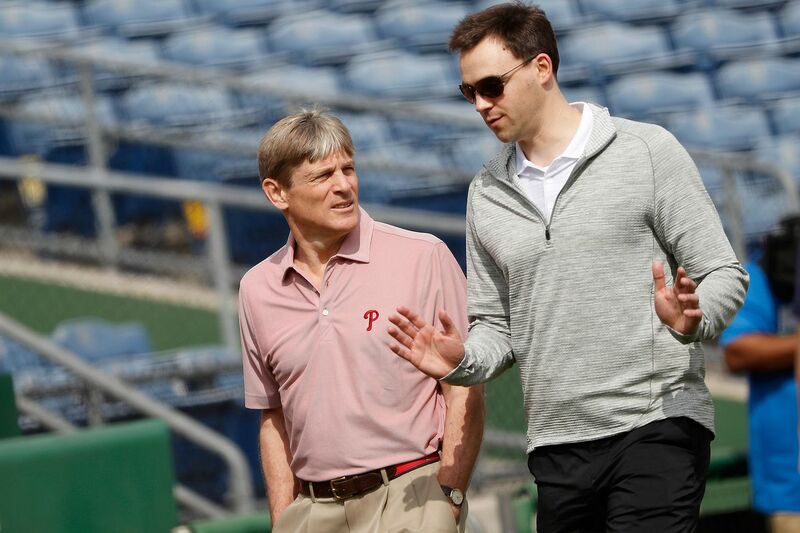 Phillies GM Matt Klentak, right, can offer advice to managing partner John Middleton, but the owner must decide if he wants to spend more than $300 million on either Bryce Harper or Manny Machado. My flight home from the winter meetings in Las Vegas Thursday afternoon was filled with a large Phillies contingent that included general manager Matt Klentak, his assistant Ned Rice and quite a few members of the ballclub’s growing research and development department. They are the people who feed Klentak the data that helps the general manager make decisions like the one to sign free-agent outfielder Andrew McCutchen to a three-year deal worth $50 million. Based on comparisons to athletic outfielders such as Carlos Beltran and Torii Hunter, both of whom remained productive well after the age of 32, Klentak decided that McCutchen, who turned 32 a couple of months ago, was well worth a three-year deal that will not break the Phillies’ bank if it does not go as planned. Ryan Howard's five-year, $125 million deal was not the only nine-figure deal in baseball history that ended up being a disaster for the ballclub. With more than four hours to kill on that flight home from Vegas, I decided to do some research of my own in an attempt to figure out how often nine-figure contracts like the ones about to be signed by Bryce Harper and Manny Machado work out in the team’s favor. Admittedly, it is a subjective exercise. You can argue that Jayson Werth’s seven seasons at $126 million did not work out for the Washington Nationals even though Nationals general manager Mike Rizzo would argue that they did. There are plenty of other cases like Werth’s. Most cases, however, are much easier than that one. Anyway, according to Cot’s Baseball Contracts at baseballprospectus.com, 75 contracts worth a total value or more than $100 million have been negotiated to date. Justin Upton of the Los Angeles Angels is counted twice, but that’s only because he renegotiated his deal before last season. For our purposes, we’re only counting his deal once. When any team signs a player to a long-term deal like the ones Harper and Machado will receive, they have two major concerns. The first is how much a player’s value is going to diminish in the final years of the contract. The second is what the commitments to those players might prevent the team from doing in the future. Former Phillies general manager Ruben Amaro Jr. sunk big dollars into Roy Halladay, Chase Utley, Ryan Howard, and Cliff Lee and when they all started to decline around the same time, the Phillies did not have the money needed to immediately replace them. Teams like the Yankees, Dodgers, and Red Sox are likely to keep spending over mistakes or misfortunes. The Phillies, who only in this century have shown the ability and desire to consistently spend among the upper-tier teams, still do not have a limitless budget. At some point, John Middleton and the Buck cousins – Jim and Pete – figure to pursue and land the free agency grand prize, but only they know if they think Harper or Machado are worth it. They must weigh that against the upcoming free-agent classes that could include star third basemen Nolan Arenado and Anthony Rendon next year and the star of all stars Mike Trout in 2020. Ultimately it is up to the owners to decide if they want to write a check in excess of $300 million for Harper or Machado. Klentak and his support team can only offer opinions as to what they think each player is worth. Anyway, back to my research, which was made much more difficult by the turbulence somewhere over Chicago. In a perfect world, the Phillies would add Bryce Harper, right, to a lineup that already includes Rhys Hoskins. But what if they strike out on Harper and fellow marquee free agent Manny Machado? After crunching the numbers, I determined that 38 of the 74 players that have signed deals of $100 million or more ended up being good investments. Twenty-five deals have not worked out and it’s too soon to make a call on another 11. Unsurprisingly, the best investments have been in players who emerged as superstars at a young age and accepted $100-million deals before they were eligible for free agency. For example, Trout’s current six-year, $144.5 million deal has been a steal for the Angels. So was Albert Pujols’ seven-year, $100 million deal with the St. Louis Cardinals that expired in 2010. The Braves are digging Freddie Freeman’s eight-year deal worth $135 million that started in 2014 and runs through 2021. It gets trickier when you start investing in players in their 30s. According to my subjective review, 15 players over the age of 30 have been good investments and 12 have not. I estimated that 23 players under the age of 30 have been good $100-million investments and 13 have not. The obvious attraction to Harper and Machado, other than their ability to play the game, is that they are in their mid-20s. That means at least the next five years should be good for them. But it doesn’t always work that way. I estimated that 13 of the $100 million contracts were disasters with seven of them being players who signed under the age of 30. I debated putting Alex Rodriguez’s second contract in that group, but he did help the Yankees win the World Series in 2009. The disasters under 30: Prince Fielder, Jason Heyward, Troy Tulowitski, Carl Crawford, Matt Cain, Barry Zito and Homer Bailey. The disasters over 30: Chris Davis, David Wright, Ryan Howard, Josh Hamilton, Jordan Zimmerman and Albert Pujols. Maybe my analysis will help John Middleton decide if he wants to remain in the Harper-Machado sweepstakes. Probably not. All history tells us is that it’s not an easy decision and the Phillies owner has to decide if the team has reached the point where it’s worth taking the risk.